FSIC: 10% Yield And 18% Discount To Book Priced For Upcoming Credit Issues? My primary concern is the amount of investments that “require close monitoring”, which has increased from 6% to 21% of the portfolio over the last two quarters. FSIC is my smallest position, I will not be purchasing shares until after the company reports Q2 2018 results in August, looking for signs of maintaining its portfolio credit quality. The company is trading at an 18% discount to NAV, and through May 9, it repurchased 3,324,358 shares at an average price of $7.52 (18% discount to NAV). During Q1 2018, there was 1.5% decline in NAV due to a markdown in its first-lien position in Safariland and markdowns in equity positions in multiple investments. There is the potential for special distributions if annual NII exceeds $0.76 per share for 2018. 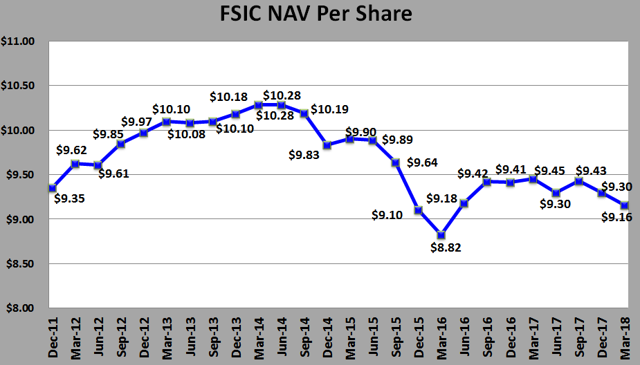 As mentioned in previous articles, I sold 50% of my position in FSIC at around $10 in late 2016 due to the anticipated dividend cut that was announced in August 2017. FSIC is currently my smallest BDC position, and I will not be purchasing additional shares until after the company reports Q2 2018 results in August, as I will be looking for signs of maintaining its portfolio credit quality. One of my primary concerns is the number of investments that “require close monitoring” has increased from 6% to 21% of the portfolio over the past two quarters. As shown below, FSIC stock price has declined significantly since 2016 likely due to the dividend cut and potential upcoming credit issues. As mentioned earlier, I am concerned about the amount of investments that “require close monitoring” increasing from 6% to 21% of the portfolio over the last two quarters. Also, 1% of portfolio investments rated “5”, implying “underperforming investment with expected loss of interest and some principal. For the quarter ended March 31, 2018, net asset value (“NAV”) per share declined by around 1.5% due to a markdown in its first-lien position in Safariland LLC and markdowns in equity positions for JW Aluminum, PSAV Aluminum Co., Advanced Lighting Technologies, Safariland LLC, andMood Media. I am expecting a rally for TPVG’s stock price as well as higher earnings for TPVG over the coming quarters for the reasons discussed in this article. On June 21, shareholders will vote on the proposal to immediately become subject to a minimum asset coverage ratio of at least 150%, permitting the company to double its leverage. BDCs will begin reporting calendar Q2 2018 results in less than two months and I’m expecting TPVG to beat projected EPS and easily cover its dividend. 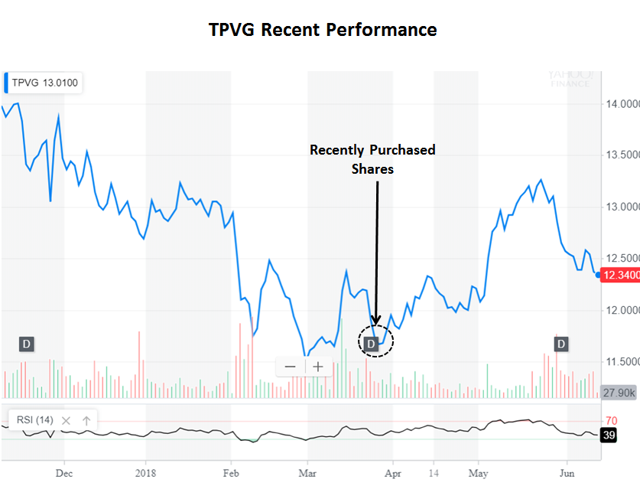 I recently purchased shares of TPVG as it was below my ST target price. Also, I use the BDC Google Sheets to identify when stocks are “oversold” with an RSI near 30 (TPVG is currently approaching). 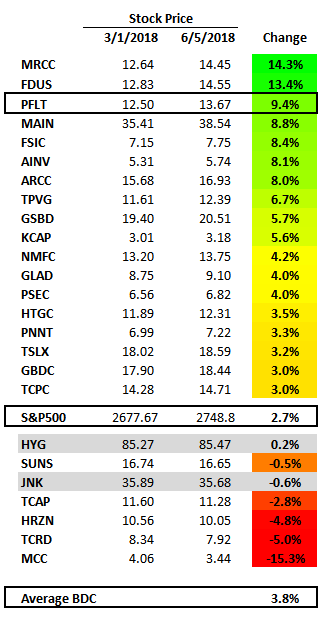 This information discussing TPVG was previously made available to subscribers of Premium Reports, along with real-time changes to my personal BDC positions, target prices and buying points, updated rankings and risk profile, any changes to dividend coverage and worst-case scenarios, suggested BDC portfolio as well as timing of Upcoming Public BDC Articles. PFLT continues to rally since my previous article and up almost 10% since March 1, 2018. I am expecting improved dividend coverage for the reason mentioned in this article. PFLT’s portfolio yield continues to rise partially due to being invested in 100% floating rate assets driving higher earnings as shown in my Interest Rate Sensitivity Analysis. Similar to other higher quality BDCs, PFLT’s management is focused on capital preservation and “underwriting as if we’re at the peak of the credit cycle”. Management purchased additional shares at the recent lows and mentioned: “Our growing portfolio, increases in LIBOR, and the doubling of PSSL should provide a strong tailwind to growing our earnings stream”. PFLT is trading under book value with first-lien senior secured investments at floating rates for investors that want solid returns without the typical amount of BDC-related risk. 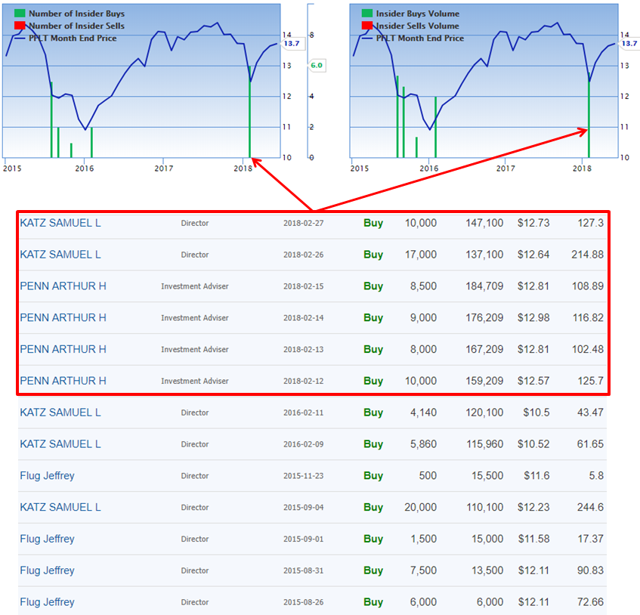 The stock price for PennantPark Floating Rate Capital (PFLT) has continued to rally since my previous article “First-Lien Portfolio Currently Paying A 9% Dividend Yield” discussing reasons to buy including rising portfolio yield and dividend coverage over the coming quarters. I am expecting BDCs to continue higher for many reasons, including the recently announced strong Q1 2018 results reported by most BDCs, with higher portfolio yields and management guidance for increased portfolio growth potential in 2018. Also, many BDCs reported higher-than-expected earnings and dividend coverage with increased net interest margins. 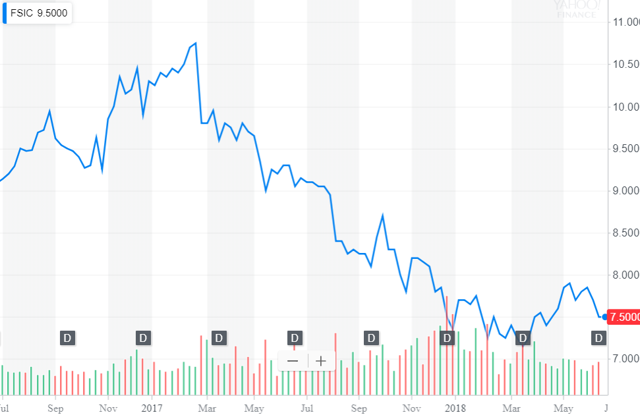 9.4% dividend yield is excellent for a BDC with protective covenants for 90% of the portfolio, 54% is first-lien, and non-accruals decreased to 0.0% due to the restructuring of Bolttech. 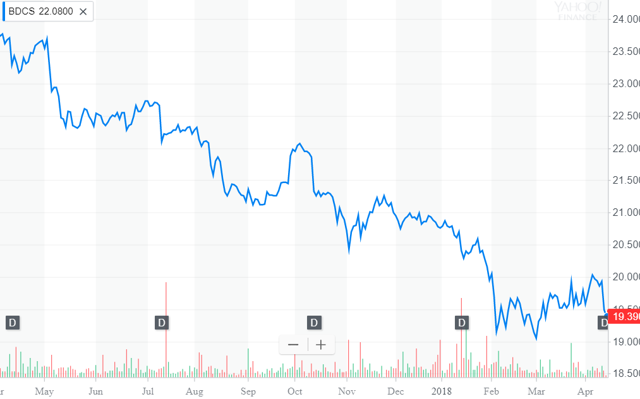 GSBD has been trading lower, the market is likely expecting an equity offering, as the company was at its targeted leverage and trading at a premium to NAV. Previously, I reduced GSBD’s short-term target price due to lower dividend coverage over the last two quarters and for my revised 2018 projections. 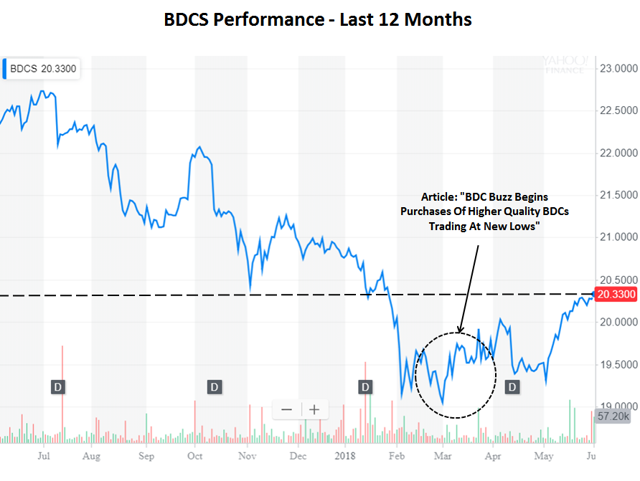 As discussed in previous articles, business development companies (“BDCs”) have been pulling back since May 2017. The following chart uses UBS ETRACS Wells Fargo Busn Dev Co ETN (BDCS) as a rough proxy for the average BDC, many of which are near new lows (including GSBD). Obviously, lower BDC prices have driven higher overall dividend yields with the average BDC currently yielding 10.6% as shown below. However, it should be noted that I’m expecting dividend cuts for a few of the higher yield BDCs as discussed in my recently updated Dividend Coverage Levels report.